As a WordPress plugin, After the Deadline replaces the built-in spell check and it works really well. By default, it only proofs your content when you hit the ‘Proofread’ button, however you can change the settings to proof as you type too. Don’t agree with what it’s suggesting? 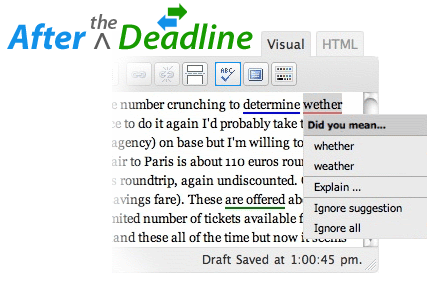 After the Deadline can educate you as to why it’s suggesting an edit if it’s got a good reason. I’m adding it to my ‘must have’ WordPress plugins list as typos are so easy to make and can be very embarrassing. After the Deadline is not just for WordPress though. You can get it as a Firefox addon or bookmarket to spell check any form field on the web. You can grab a copy of After the Deadline from http://afterthedeadline.com/ or add the plugin directly to WordPress by using the built-in plugin installer. Don’t let typos and grammatical errors get in your way, look professional and write content that people will be happy to read with the help of After the Deadline.